It is National Dog Bite Prevention Week. So we thought we would rerun this article that was originally posted on May 17,2011. Whether you’re getting your dog ready for the arrival of a new baby, or you have children and plan to adopt a dog, Jennifer Shryock, mother of four, has useful information for you. A Certified Dog Behavior Consultant, Jennifer has more than 20 years of hands-on experience with dogs and a background in special education. She has combined her love of working with dogs and children into a national program called Dogs & Storks. She also works with an organization called Doggone Safe. Jennifer provides families with support before and after a baby arrives, as well as teaching children how to stay safe around dogs. For National Bite Prevention Week (May 20 – 26), we asked Jennifer how to create safe and successful experiences for dogs and kids. SD: If a family with children is planning to adopt a dog from a shelter or rescue, do you think it’s safe to adopt an adult dog? Or are puppies a safer choice? JS: Actually, I never recommend puppies for families with active young children. Puppies are an open book and although that can be appealing to some families, they have yet to show “who they are.” When matching families with kids to a new canine companion, I highly recommend a mature dog. Usually between 3 and 5 is great. In that age range, generally, what you see is what you get. We have always had dogs that are older than 2 enter our home. In my experience, puppies and young children can be very frustrating and overwhelming for each other. 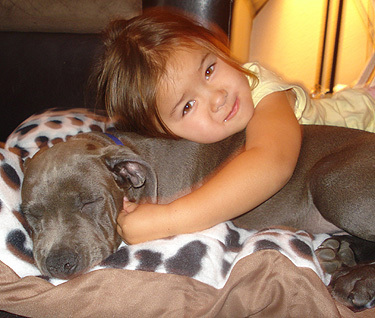 SD: Many parents who have pit bulls are subjected to intense criticism from family and friends – a common refrain is that it’s irresponsible to own a pit bull when you have a child. 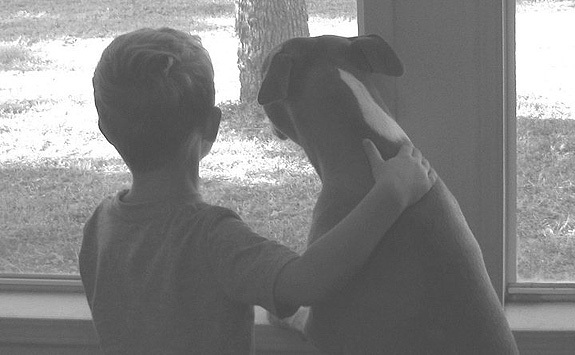 What are your thoughts about pit bull-type dogs living with children, particularly younger children? JS: I am so sad to see discrimination toward any type of dog. Dogs are dogs and, just as with people, we do so much damage when we assign a negative to an entire group. Each person and each dog is unique. Every dog offers individual characteristics and behavior. That’s what we must look at – not a “label” that is meant to create fear. It is unfortunate that many people stay misinformed. I do my best to offer education and resources to those interested. 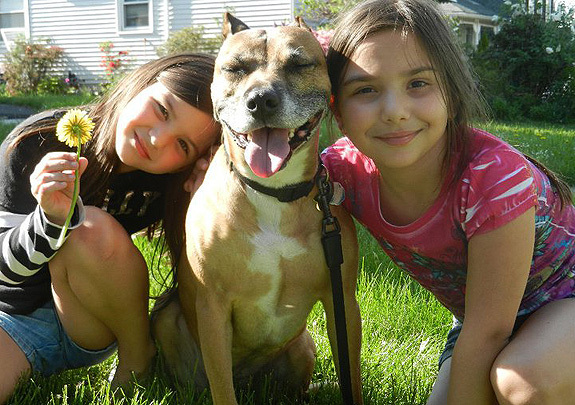 We adopted our pit bull (Windsor) in 2008, after he had been chained up, alone, for five years. At the time, we had three other dogs, five cats, and three children (ages 12, 11 and 7). Six months following his adoption I was pregnant with our fourth child. So, we prepared. We prepared Windsor just like we had with our other three dogs. Each of our dogs has his own quirks, so we use proper management and supervision to be sure they are successful with our children. SD: Do you have any advice for new parents? How can they help their dogs adjust to the arrival of a new baby? JS: I have tons of advice in this department, and I invite your fans to visit our blog or our check out our DVD. The key is preparation and follow through. Dogs look to us for direction and guidance. Many families feel guilty when they are expecting a baby, and they worry about the dog. Try not to project too many emotions onto your dog. Instead, find things for the dog to do. Hire a pet sitter or dog walker to allow them some outside time. Work on practicing tricks or basic obedience skills. Provide your dog with mentally stimulating activities such as doggie puzzles, stuffed Kongs or Buster Cubes to keep them busy and to give them treats. This will help your dog use up energy. When you do this in the room where the mother and baby are, it also creates a positive association with the new baby. Ultimately the dog will adjust. Allowing the dog to observe and take part in the daily routines (with awake adult supervision) is the best way to help them adjust to life with a baby. SD: National Bite Prevention Week is here – do you have any tips for our young fans for staying safe around dogs? JS: Absolutely! I teach kids to always remember: If a dog is FREE, BE A TREE. Don’t flee, be a tree. Teaching and practicing the BE A TREE pose is the best thing to do! Here’s how: Plant your roots, count your breaths and fold your branches. Watch your roots grow strong and deep into the ground. Breathe and hold this pose until the dog moves away or help comes. You can see it here. Kids can use this when visiting friends with excited dogs or with dogs they are uncomfortable with in the home. They can also learn about dog body language to understand canine clues. Being a Doggie Detective is a great way to be empowered, respect dogs and increase safety! Lastly, remember that dogs may not always want to be approached. Think about how you feel when someone you don’t want in your space is crowding you. Keep that in mind when you think about dogs and remember that the best way to show how much you love them is by respecting their comfort level. That’s a true form of love! 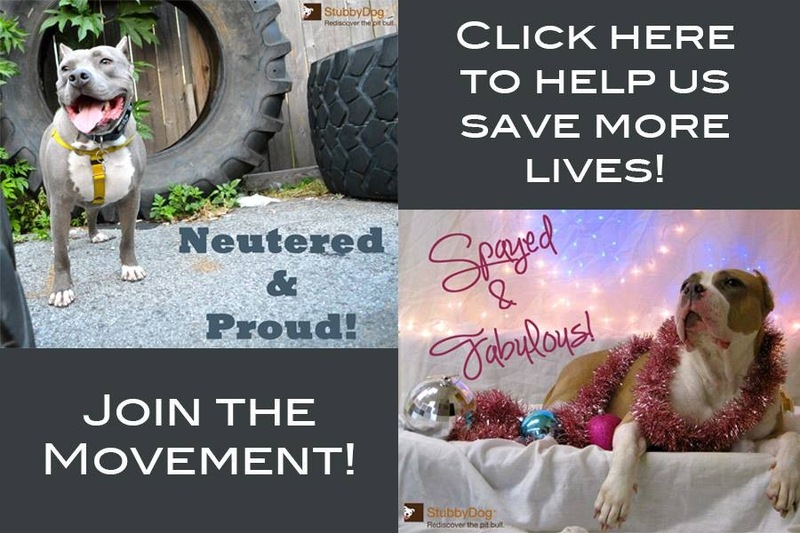 For more information about Jennifer’s programs or to learn more about bite prevention, how to prepare your dog for a new baby, or advice on creating safe, fun interactions for kids and dogs, please visit Dogs & Storks and Doggone Safe . Information like this needs to be handed out to all persons adopting any breed of dog. And ” If a dog is FREE, BE A TREE. Don’t flee, be a tree.” should be taught to children in schools. I bless your efforts. @JeneenBurns Thank you so much. Great article – and cute photos!! When Rob was on his way I used a book called Tell Your Dog You’re Pregnant: An essential guide for dog owners who are expecting a baby. It was really helpful and came with a CD of sounds. Paris took some time to get used to the sounds but the book helped on how to do it. I think the website is http://www.babyandpet.com. Maybe that will help someone else! @ImogenSteele Thank you for the info. We love the title of the book! I hope someday all pit bulls will have a loving human family. The “be a tree” thing is good advice. Thanks for sharing.